“Ability to Advance Knowledge and Capacity to Achieve the Impossible” in Handbook of Research on Learning in the Age of Transhumanism. Eds. Serap Sisman-Ugur & Gülsün Kurubacak. Hershey, PA: IGI Global Publishing. “A Flickering Flame: Goodness as a Candle in the Dark” [TBD]. Amsterdam, NL: Nexus Institute. “Technoscience, Transhumanism, Telos” in Oxford Handbook of Symbolic Evolution. Oxford, UK: Oxford University Press. *“ The Body Vehicle: An Argument for Transhuman Bodies” in Modified Living as a Cyborg. Chris Hables Gray, Heidi Figueroa-Sarriera & Steven Mentor. NY, NY: Routledge Taylor & Francis Group. “History of Transhumanism” in Transhumanism. Ed. Newton Lee. Springer International Publishing AG. *“The Mitigation of Aging” in Nanotechnology, Nanomedicine, and AI: Toward the Dream of Global Health Care Equivalency. Ed. Frank Boehm. CRC Press. *“Wisdom [Meta-Knowledge] through AGI / Neuro Macrosensing” in Artificial Intelligence of Information: A Multidisciplinary Perspective. Ed. Steven Gouveia. Vernon Press. 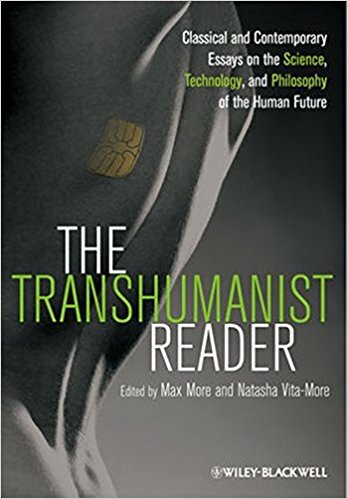 An Argument for Transhuman Bodies” in “Posthuman and Transhuman Bodies in Religion and Spirituality”. Sophia International Journal of Philosophy and Traditions. Springer Pub. “Image Spread” in Art Against Art. Ed. Taslima Ahmed. Issue #2 – Spring/Summer 2016. Berlin, Germany. “Science in Design” in NOEM Technology & Society. Ed. Pierre Luigi Capucci. Ravenna, Italy. TBD 2016. “Primo Posthuman” for “A Feminist Genealogy of Posthuman Aesthetics", Ferrando, Francesca, in Palgrave Communications Journal, and Audiovisual Posthumanism, 2016. “Transhumanism: The Growing Worldview” in Google It: Total Information Awareness. Ed. Newton Lee. 1st 2017 Edition, Springer Publishing. "Persistence of Long-Term Memory in Vitrified and Revived elegans” in Rejuvenation Research Journal, 2015 Oct;18(5):458-63. doi: 10.1089/rej.2014.1636. Liebert Publishing. “Design of Life Expansion and the Human Mind” in Intelligence Unbound: The Future of Uploaded and Machine Minds, (Eds. Blackwell & Broderick). Wiley-Blackwell. “Contested Culture: The Plausibility of Transhumanism” in Existenz,8-2. 2014. “Transhumanism: an iterative design challenge” in Anticipating 2025, UK: London Futurists. 2012. “Extended Minds” in Sistemi Intelligenti. Bologna, Italy: Il Mulino Publishing House. 2012. "Aesthetics: Bringing Arts/Design Into the Discussion of Transhumanism" in The Transhumanist Reader: Classical and Contemporary Essays on Science, Technology, and Philosophy of the Human Future (John Wiley & Sons, Inc. / Wiley-Blackwell, Publishing). 2012. “Life Expansion Media” in The Transhumanist Reader: Classical and Contemporary Essays on Science, Technology, and Philosophy of the Human Future (Wiley-Blackwell, Publishing) 2012. “Epoch of Plasticity” in Sistemi Intelligenti. Italy. (Academic Journal). 2012. "Human Enhancement: Co-Evolving with the Brain -transformative (conceptual/actual/critical) media" in BEYOND DARWIN: the co-evolutionary path of art, technology and consciousness. María Gómez-Lechón. Valencia, Spain: SALA PARPALLÓ Diputación de Valencia. 2011. “Zone of Life Expansion” in AI Society, Issue on “Biotopia”. Heidelberg: Springer. 2011. "Epoch of plasticity: The metaverse as a vehicle for cognitive enhancement" in Metaverse Creativity. London: Intellect. 1, Number 1. pp. 69-80. "Zone of Life Prolongation" in Technoetic Arts - A Journal of Speculative Research. Bristol, UK: Intellect Ltd.
"Bringing Arts/Sciences and Design into the Discussion of Transhumanism" in Transhumanism and Its Critics. Philadelphia: Metanexus Institute. Chapter 4, pp. 79-96. "Aesthetics of the radically enhanced human" in Technoetic Arts: A Journal of Speculative Research. Bristol, UK: Intellect. 8, Issue 2. Nov. 2010. pp. 207-214. "Life Prolongation: Tools and Consequences" in Nanotechnology Now. Online 7thWave, Inc.
"We are Strong: Only Insofar As We Take Advantage of Our Innate Abilities and Build Smarter Tools" in Nanotechnology Now. Online 7thWave, Inc. Zone of Life Prolongation" in BIOTOPIA (Eds. Morten Søndergaard and Victoria Vesna), New York: Springer Verlag. "Bone Density" in Evolution Haute Couture, art and science in the post-biological age, Bulatov, Dmitry (Ed) Kaliningrade: KB NCCA pp. 64-65. "Transhuman Statement" in ARTISTS' MANIFESTOS, New York: Penguin Modern Classics. “The Aesthetics of Transhumanism in TIF English Journal. Institute of Media Arts, Yonsei University. “Bringing Art/Science and Design Into the Discussion of Transhumanism”. The Global Spiral, Winter Special Issues. “The Mediated Technological Singularity: Human Use as a Passport to Technological Innovation”, in New Realities: Being Syncretic. Wein, New York: Springer. pp. 306-309. "Designing Human 2.0 — Regenerative Existence". Volume 3, Pub. Routledge. “La Guerra del diseno: Humanish vs. Postbiologico – una Practica del Juego con Posibles Efectos en la Humanidad" in Homo Ludens. Gijon, Spain: Laboral, pp 172-179. "Brave BioArt 2: Shedding the Bio, Amassing the Nano, and Cultivating Posthuman Life." in Technoetic Arts: A Journal of Speculative Research. Volume 5.3, pp. 71-86, London: Intellect, Inc.
"Strategic Sustainable Brain". Nanotechnology Perceptions: A Review of Ultraprecision Engineering and Nanotechnology, Volume 2, No. 1, March 27. Collegium Basilea, Pub. Institute of Advanced Study, Basel, Switzerland. "The Perfecting of Man" in AnOtherMan, Issue 3, Autumn/Winter. “Global Design”. The Journal of Geoethical Nanotechnology. Vol. 1: Issue 1:1st Annual Workshop on Geoethical Nanotechnology, Terasem: Vermont. “Sustainable Futures,” Death And Anti-Death, Volume 3: Fifty Years After Einstein, One Hundred Fifty Years After Kierkegaard, Charles Tandy (ed), Palo Alto, California: Ria University Press. ”The New Genre – Primo Posthuman”, Technoetic Arts, Ciberart-Bilbao Conference Publication. ”Primo Prototype – the New Human Body Design,” Cumulus Working Papers, Pub. Series G: University of Art and Design Helsinki, Helsinki, Finland, Sotamaa, Y. (ed) Cumulus Journal, “New Body –Trans Post Human” pp. 9-12. “Considering Aesthetics in Our Highly Technological Culture”, Cryonics, 1st Qtr. Vol. 22:1, p.45. “Pro-Act”, Alcor Reaching for Tomorrow, 2nd Qtr. Vol. 22:2, p. 37. Create/Recreate: 3rd Millennial Culture, Los Angeles: MoreArt. “Total Isolation” Cryonics, 2nd Qtr. Vol. 20:2, p. 10. “Memories of the Memorial (Timothy Leary)”, Extropy, Vol. 17, p. 38. “Stewart, Williams Headline 13th Annual Telluride Fest” Hollywood Reporter, Sept 10, Vol. CCXCIII, No. 34. “Agent Kohner Feted at Telluride” Hollywood Reporter, 9/10/85, Vol. CCLXXXVIII, No. 32, p.1. “Telluride Festival Honors Widmark, Tarkousky” Hollywood Reporter, Sept 6, Vol. CCLXXVII No. 25, p.3. “Testament Play at Telluride Spurs UA Classics Pickup” Hollywood Reporter, Sept 14, Vol. CCLXXVII, No. 31. “Image Spread” in Art Against Art. Ed. Taslima Ahmed. Issue #2 Spring/Summer 2016. Berlin, Germany. “Transhumanism: The Growing Worldview” in Google It: Total Information Awareness. Ed. Newton Lee. 1st 3d. 2017 Edition, Springer Publishing. "Persistence of Long-Term Memory in Vitrified and Revived C. elegans” in Rejuvenation Research Journal, 2015 Oct;18(5):458-63. doi: 10.1089/rej.2014.1636. Liebert Publishing. “Contested Culture: The Plausibility of Transhumanism” in Existenz, Vol.8-2. 2014. "Human Enhancement: Co-Evolving with the Brain -transformative (conceptual/actual/critical) media" in BEYOND DARWIN: the co evolutionary path of art, technology and consciousness. Ed. María GómezLechón. Valencia, Spain: SALA PARPALLÓ Diputación de Valencia. 2011. "Epoch of plasticity: The metaverse as a vehicle for cognitive enhancement" in Metaverse Creativity. London: Intellect. Vol. 1, Number 1. pp. 69-80. "Aesthetics of the radically enhanced human" in Technoetic Arts: A Journal of Speculative Research. Bristol, UK: Intellect. Vol. 8, Issue 2. Nov. 2010. pp. 207-214. “Nanomechatronics Nanosystem and Mitochondria Symbiosis” in Nanotechnology Now. Sept, 23. “Posthuman - Putting Transhumanist Perspective into Contrasting Theories” in Nanotechnology Now. Aug 2. “TransVision 2018”, Madrid, Spain. Oct 19-21. “Human Meaning in an AI World”, Humanity+ @ China, Beijing, China. July 8-12. “Sixth Annual Conference on Governance of Emerging Technology”. “AI, Democratization of Regenerative Generations”. ASU, Phoenix, AZ. May 16-18. “Austria Gamechangers Festival”. Vienna, Austria. April 19-21. “Global Leaders Forum” TV Chosun. Seoul, South Korea. Nov. 15-16. “TransVision”. Brussels, Belgium Nov. 9-11. “Fifth Annual Conference on Governance of Emerging Technology”. “Alternative Model for Regenerative Generation”. Phoenix, AZ. May 17-19. “Cambridge Debate: This House Fears the Coming of the Immortal Generation”. Cambridge, UK. May 4. “World Business Dialogue”, University of Cologne, Cologne, Germany. March 9-11. “Fifth Annual Ways of Knowing Conference”. “Posthuman and Transhuman Bodies in Religion and Spirituality”. Harvard Divinity School. Oct. 27-29. “RAAD Fest”. San Diego, CA. Aug. 4-7. “Human Augmentation”. Turner Broadcasting and CNN. NYC, Aug. 2-3. “Extreme Futures Technology and Forecasting”. Microsoft Reactor. San Francisco, CA. Oct 22. “Future of Mind Symposium”. The New School, NYC. July 20. 4th Annual Governance Conference on Law, Policy. Arizona State University. Tempe, AZ. May 24-26. “Future of AI”. Digital Hollywood, Los Angeles, CA May 4-6. Keynote. NYU Posthuman Conference. New York University. “Next Level”. 3rd Annual Lifesceience R&D Big Data Leaders Forum. Jan 19 21, 2016. “Scientific Research – C. elegans Memory”. Alcor Life Extension Foundation. October 25. Scottsdale, AZ. “Evolution”, USB “Innovation and Future Trends in Physiology and Health”, October 15. Berlin, Germany. “Body by Design”, IFA+ Summit, Berlin, Germany. September 7-8. Keynote, Geek Picnic. ITMO University, St. Petersburg, Russia. June 11-12. Brink Institute Conference. Palm Springs, CA. June 5-7. "Pour une philosophie du Soi amélioré. Discussions avec une transhumaniste. Colin T. SCHMIDT - Ensam Paris Tech - Université du Mans Natasha VITA MORE - Humanity + & Simon RICHIR - Ensam-ParisTech Nangers, March 12. “Body by Design”, Emerging Technology. All Events. Istanbul, Turkey. Feb 20-21. Annual Consciousness Conference. Tucson, Arizona. June. International Space Development Convention. Los Angeles. June 2014. Anticipating 2025. London. February 22-23, 2014. Talk TBD, Transhuman Visions, San Francisco. March 1, 2014. “Body by Design: an Iteration for Life”. TEDx Munich, Munich, Germany. February 24, 2014. “Body by Design”. Being Human 2013, The Baumann Foundation. Nourse Theater San Francisco. September 28. “Bionic Sports of the Future” Panelist. SportsAccord Convention. Moscow, Russia. September 16. “Contested Culture: The Plausibility of Transhumanism”. American Philosophical Association. Karl Jaspers Society of North America. San Francisco. December 11. “Substrate Autonomous, Networked Avatar Bodies by Design”. GF2045, Lincoln Center New York City. June 15-16. “Why Build a Better Body”. Stanford University. Advancing Humanity Symposium. March 23. “H+ Beyond Data”, San Francisco State University. Humanity+ @ San Francisco. December. “Design Options” at Human Design or Evolution? Aalto University, Helsinki. Jan 28- Feb 2. “Hi Tel Aviv! Radical” at Radical Life Extension Festival. (filmed talk) Tel Aviv. Jan 16. The Arts and Human Forms” at Extreme Futurist Festival, Los Angeles. Dec 18. “Life Expansion Project” at Humanity+ Conference, Polytechnic University, Hong Kong. Dec 3-4. “Life Expansion” at Maison de la Recherche, Sorbonne University, Paris. June 16. 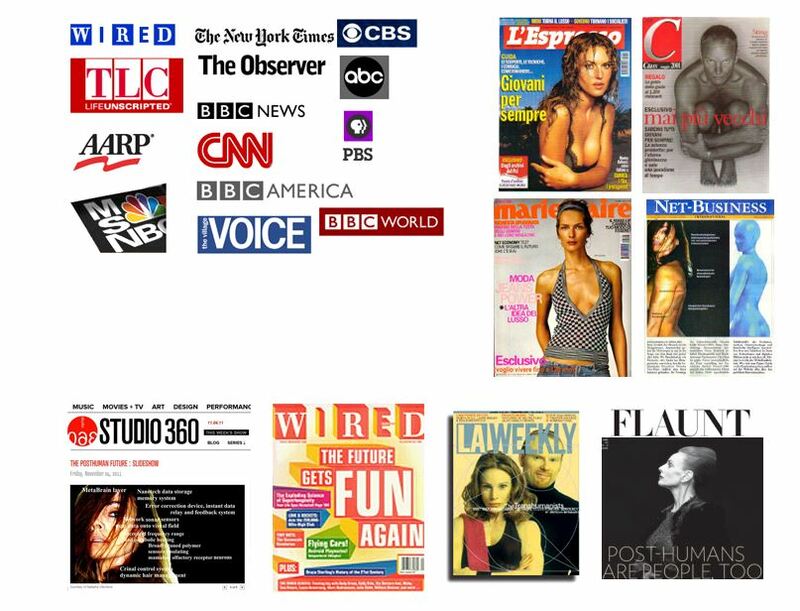 “Rewire Conference – Leonardo magazine. FACT, Liverpool, UK. Sept 30- Oct 2. “Human+” at Human+ Science Gallery, Dublin. June 6. "Designing Substrate-Independent Minds" at the Humanity+ Conference at Parsons The New School for Design, New York, New York. May 15-16. "Emerging Transmortal Designs for Wearable Selves" at Exploring Human Enhancement: A Symposium, The Center for Values in Medicine, Science, and Technology. University of Texas, Dallas. April 8-9. "The Singularity: Humanity's Huge Techno Challenge", SXSWi Music + Film, Austin, Texas. March 13. Emerging Designs of Wearable Selves" at the Humanity+ Conference at California Institute of Technology in Pasadena, California. "The Expectant Automorpher" at the TransVision Conference in Milan, Italy. "Zone of Life Prolongation" at the BIOTOPIA SYMPOSIUM - PORT 20:10 International Conference in Aalborg, Denmark. "Human Enhancement Technologies: Mejoramiento de Calidad de Vida en Latinoamérica a través de Nanotecnología" at the Nanotechnology & Mechatronics International Forum in Cartagena, Colombia. "Human Enhancement: Technological Singularity and Transhumanism" keynote at GOGBOT Festival in Enschede, Netherlands. "Interconnected Significance: Human Enhancement and Radical Life Extension" RE:live Media Art History Conference, Melbourne, Australia Nov 26-29. "The Sciences and Technologies of Human Enhancement" Super Human Conference, Melbourne, Australia Nov 21-23. "Design Aesthetics of the Radically Enhanced Human" 10th Annual Planetary Collegium International Research Conference, University of Applied Sciences, Munich, Germany Nov 19-21. "An Optimal Neo-Normal", AND Conference, Liverpool, UK Sept 26-27. "Transhumanist Aesthetics" Metanexus Institute Annual Conference, Tempe, Arizona July 18-19. "Design Issues Concerning Extreme Life Extension" American Philosophical Association, Annual Meeting, Vancouver, British Columbia April 10-12. "Human Futures on the BRINC" Associate of Professional Futurists Meeting, Pasadena College of Art and Design, Pasadena, CA March 20-21. "Human Enhancement of Extreme Life: Co-Evolving on the BRINC, Beyond Darwin Conference, Sala Parpallo, April 19-29. "Morphological Freedom" Stand-Up for Human Rights Conference, Pozan, Poland. Feb 26. "Hybrids" Trondheim Matchmaking 2008 - Annual Festival for Arts and Technology. Trondheim, Norway 16- 18 October. "The Law of Intended Consequences: Designing Possible Futures" The First Conference on Artificial General Intelligence Workshop on the Sociocultural, Ethical and Futurological Implications of AGI, FedEx Institute of Technology, University of Memphis, in cooperation with AAAI, March 1-3. "Human 2.0 DESIGN how biotechnology, generative media, and other currents are changing creative inquiry in the arts & sciences" Pecci Museum, Contemporary Art Center, Prado, Italy. "Brave biological design – how biotechnology, generative media, and other currents are changing creative inquiry in the arts & sciences" The Third SENS Conference: "Strategies for Engineered Negligible Senescence" Queens' College, Cambridge University, England, 6-10 September. “Brave BioArt 2: shedding the bio, amassing the nano, and cultivating emortal life” Reviewing the Future Conference, Montreal Canada. "POSTHUMAN – naked and hypermodern" TransVision 2007, Field Museum, Chicago, 24-26 July. “Skin EXObody” FAQ?, Sao Paulo, Brazil. “Wisdom through AGI / Neural Macrosensing” TransVision, Helsinki, Finland. “Wisdom through AGI / Neural Macrosensing” Consciousness Reframed, 8th International Research Conference, Plymouth, UK. “Global Design” First Geoethical Conference on Nanotechnology. Terasem Movement, Inc., Vermont Retreat. “Sustainable Humans” Building Energy Conference, World Trade Center, Cambridge, MA. “Body Slam!” Yale University, WTA Conference on the Future. “New Body Design” Keynote. Cumulus Conference “Value in Design”, Academy of Arts, Tallinn, Estonia. “Defeat the Retros and Take Back our Future” NYU NY, New York. “Body Talk”. “Man TRANSforms Conference” NY, New York. “A Talent for Living: Cracking Myths of Mortality” 4th Alcor Foundation Conference on Technology, Monterey, CA. “The Future of Gender and Sexuality” Extro 3 Conference, San Jose, CA. “Ageless Thinking” Resources for Independent Thinking, Berkeley, CA. “Reinventing Art - Recreating Reality” Extro 2 Conference, Los Angeles, CA. “Future of Culture” Keynote Speaker, Future 2000, Los Angeles, CA. “Art Music and Entertainment” 1st Japan - America Grassroots Summit, Tokyo, Japan.